Oh, Boeing Boeing. Oh, Farce. 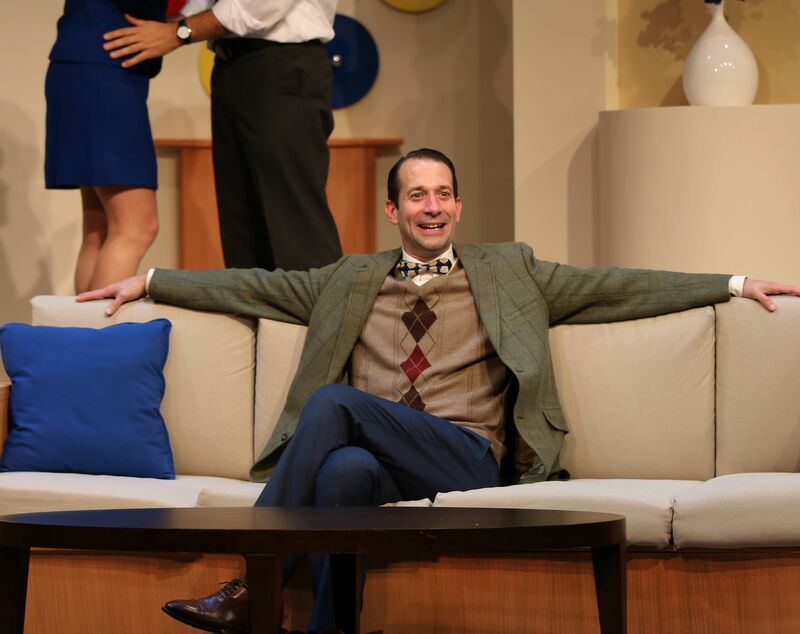 Jeffrey Binder is the Artistic Associate of Gulfshore Playhouse. In some ways rehearsing a farce is a little bit like having a root canal: you don’t remember how painful it was until you’re back in the dentist’s chair. On the surface, a farce should be easy, right? I mean, the dialogue is light, the characters are written in broad strokes and easy to grasp, and it’s fun and funny and breezy. I always love it when the cast gets together for the first reading of a farce – everyone’s all smiles, we read through the play with the director and designers, and everyone hears the dialogue zip along at a clip and imagines in their own head all of the crazy things that are happening on the page and smiles and laughs and we all go home feeling great about it! Day two is when the actors and the director sit down and try to figure out the puzzle of how to make the script come alive, and how to make all of the crazy business that’s written into a play like Boeing Boeing come together in a fresh, funny way. And for the next three weeks the cast digs in, hour after hour and day after day, attempting to build a tight, almost musical, comic choreography to the script that looks effortless and fun. The cast painstakingly moves back and forth from line to line and page to page of the script, going back over it again and again. They spend hours weeding out the things that worked on day two or day ten but no longer work on day twelve or day fifteen and go back to the drawing board time after time to create a new physical story, all while trying to memorize the lines well enough that the dialogue rolls off the tongue with barely a thought. There’s a need to get off book as quickly as possible in farce so that everyone in the rehearsal room can see what happens when the actors can truly listen and talk to each other, grounded in the rapid-fire dialogue giving the near-constant scenic action meaning and context. Because let’s face it, it’s hard to talk to someone and listen to them if your face is buried in a script trying to remember what you’re going to say next. The Director: Alright so in this moment of the scene… Berthe you look at Robert, Robert you look at Bernard, then Bernard you look back at Berthe. When Bernard looks at you, Berthe, Robert looks back to you and you look out at the audience. Berthe: Now do I look straight out right away when he looks at me or do I look at him for a beat and then look out. The Director: Try it both ways but I think you may look straight out. Gabriella: Who do I look at? The Director: Well… maybe… try looking at Robert first and then when he looks at Bernard, look at Bernard. Then back to Berthe. Berthe: Maybe I should look at Gabriella? Gabriella: I don’t think so. Why look at me? I don’t have the answer, I’m asking the question. The Director: No don’t look at Gabriella because you need to know what Bernard is going to say to Gabriella. Gabriella: Right. Wait. You mean Berthe. The Director: Well Bertha is waiting for Bernard to answer Gabriella, but Bernard puts Gabriella’s question on to Bertha. The Director: Gabriella, you look at Bernard. Then Bertha, when he looks back at her. Berthe: Right. So I look straight at Bernard. The Director: No you look at Robert, who then looks at Bernard. Robert: You look at me. Berthe: Or maybe I look at him and we both look at Bernard. The Director: We can try that, but then when Bernard looks back at you, you have to look out. Robert: But I think you look at me, I look at Bernard, Bernard looks at you, I turn back to you, then you look out. Gabriella looks to me and then Bernard and then back to you. The Director: Ok, lets take a break. Did I forget to mention that to make the farce truly work, the actors and director need to find the core of truth in the entire story so that you believe who these characters are, exaggerated as they may be, and actually feel for them? 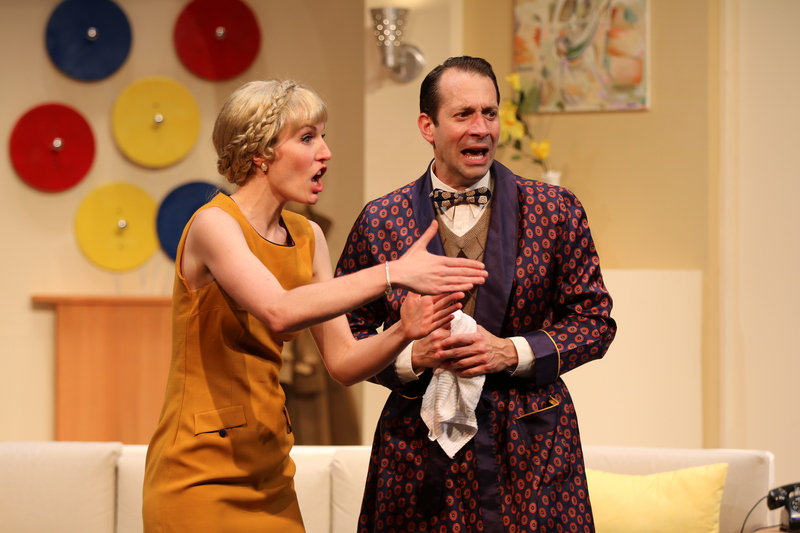 Farce is more than acting, it’s part acting, part dance, part clowning, part stand-up comedy, part dream when you were a kid in which you found yourself standing at the chalkboard in front of the class not wearing any pants – and it’s all in the timing. willing body. There’s a joy that comes when a farce is running on all cylinders that’s difficult to achieve in any other style of play – and that joy, I think, is what an audience comes to see. Creativity, endurance, clever turns and improbable circumstances happening to characters on stage you care about, and who then react in extreme, sometimes desperate but herculean ways. When it’s all done with the joy of seeing something so alive, and ultimately, so ridiculously human – that’s what I think connects an audience to farce that’s far deeper than the script on the first day would have you believe. Right on! I love the way he explained this. To me; no, to them. To us? Yes, well, most of us. All of us? Perhaps–lol.